Joseph Fehringer was born on 29 December 1865 in Lookout, Ripley, Indiana, the son of Anton Fehringer and Magdalena Bechtel. He died on 8 September 1946 in Tomahawk, Lincoln, Wisconsin. He is buried in Calvary Cemetery, Tomahawk, Lincoln, Wisconsin. 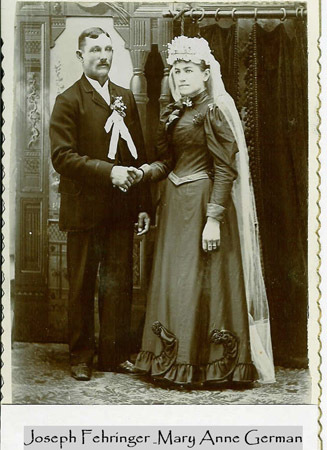 On 12 February 1895 he married Mary Anne German in St. Mary Catholic Church, Humphrey, Platte, Nebraska. She was born on 27 August 1874 in Peoria County, Illinois and died 13 July 1967 in Oshkosh, Winnebago, Wisconsin. She is also buried in Calvary Cemetery, Tomahawk. Additional information on this line was submitted by Joan Savage to World Family Tree - Volume 20 Tree 0675, found on www.familytreemaker.com.